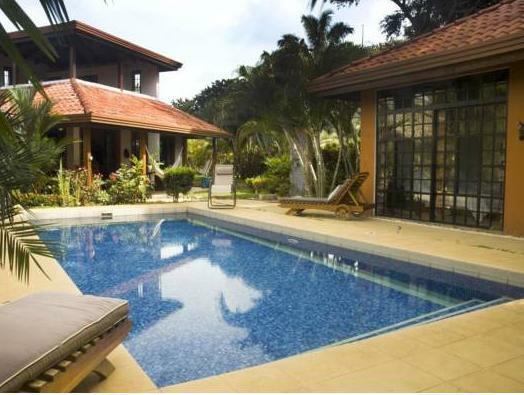 ﻿ Best Price on Vista Hermosa Bed and Breakfast in Tambor + Reviews! Just a 10-minute walk from the beach, this boutique B&B features an outdoor pool surrounded by lush gardens and exotic fruit trees. Vista Hermosa offers free transfers from Tambor Airport. Rooms and suites at Vista Hermosa Bed and Breakfast feature air conditioning, flat-screen satellite TV and views of the gardens. All rooms have a private bathroom with free toiletries. A varied daily breakfast is included, and the Vista Hermosa can arrange local and international meals on request. You can also relax with a drink in a hammock. You can use the free Wi-Fi in public areas of the Vista Hermosa. The property also offers a full concierge service, which can arrange in-room massages, car rental and personalized tours. Tambor Airport is just 5.3 mi from the B&B. The town of Montezuma is a 30-minute drive away, while San José is 186 mi away. Prepayment must be made by Paypal. Please contact the property in advance for more information, using the contact details provided on your booking confirmation.